The insecurity in eastern DRC continues to cause huge internal displacement of people, and the Office of the UN High Commissioner for Refugees (UNHCR) and humanitarian agencies continue to face this problem, as well as that of refugees in both the DRC and its border countries. Marcellin Hepie, UNHCR Deputy Representative in the DRC, gives us a progress report on the current situation. There are Congolese refugees in nine bordering countries. What is the situation regarding their return? Indeed, there are 321,195 Congolese refugees in the nine countries which make a common border with Congo: Angola, Burundi, Congo, the Republic of Central Africa, Rwanda, Uganda, Sudan, Tanzania and Zambia. The situation is that many of these refugees wished to return to the DRC, especially before election day in 2006. There were many which returned and we are in the process of insisting on the return of many more, in particular from the Republic of Congo, Tanzania and Zambia. With regard to Zambia, we temporarily suspended our operations because of the Moba incidents which occurred on 1 August 2007. There are refugees from seven countries in the DRC. What is their current status? Obviously, there are 182,232 refugees from seven of the nine adjoining countries, except for Zambia and Tanzania who do not have refugees in the DRC. Concerning the departure of these refugees, for the moment, there are no operations but we will begin again soon. There are negotiations underway, in particular the tripartite agreement with Rwanda and Burundi, and then these refugees will be able to return. What is the situation of the internally displaced persons (IDPs) in DRC? With regard to the 1.2 million internally displaced people, this is the major challenge which humanitarians, and not only UNHCR, have to face. 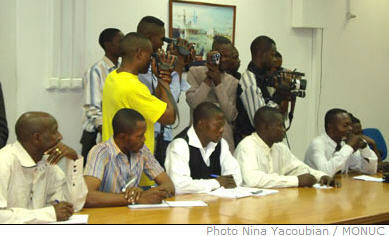 The Minister for humanitarian associations mentioned a figure of 10 million Congolese who may be internally displaced. The situation which worries us more is that for the month of June and July 2007 alone, 640,000 people were internally displaced because of conflict in the Kivu provinces. But in Katanga and Equateur provinces we have many IDPs as well, and we must intervene everywhere at the same time. We are not alone in this respect, as we use the cluster approach with regard to protection of those displaced, in coordination with MONUC. It is necessary to protect these displaced persons, to see under which conditions they live, to evaluate the violence which these people are subjected to, and to find daily solutions for their problems. With regard to our community revival programme, we work on this with the UNDP. We are partners, but there are other UN agencies and NGOs which intervene also. Our specific job is to manage the camps and to organise shelter for those who need it. Other actors such as the UNICEF work with regard to education and other needs for displaced persons. There was also the case of our intervention in Mitwaba, where after ceasefires the UNHCR and its partners intervened. Over there, we used a real multi-sectoral approach because we were responsible, along with partners like the GTZ and others, for the construction of roads, shelters and other facilities. In Mitwaba, one can see the lives of these displaced persons practically transformed, because of the intervention of UNHCR and its partners. You spoke about the humanitarian situation in the east. What is the current situation in Ituri district? In Ituri, the situation has improved considerably. Now that the security situation is relatively good, we will open an office soon in Kisangani, to be able to reach these displaced persons over there. We are developing a programme with UNOPS and initially we will start in Dongo, and then we will turn our attention to other areas. What is the current status of Zambian refugees in Katanga, and specifically in Moba? We had an operation which went very well until 1 August 2007, when our installations were attacked and those of MONUC completely destroyed, with four blue helmets wounded. The UNHCR was besieged as stones were thrown at our offices and cars. Thank God there no were serious injuries, although one of our guards was slightly wounded. Our personnel were evacuated and relocated to Kalemie. We now await the green light from the Special representative of the UN Secretary General in the DRC, before the UNHCR and other humanitarian agencies can return to Moba to continue our operations. We want to return as we are under pressure on behalf of the refugees and our colleagues in Zambia, because the refugees want to return to find their parents, friends and property which they left behind many years ago. We have the obligation to assist these refugees so that they can return home.